Trotter Racing :: Back To Back for Empire! Back To Back for Empire! 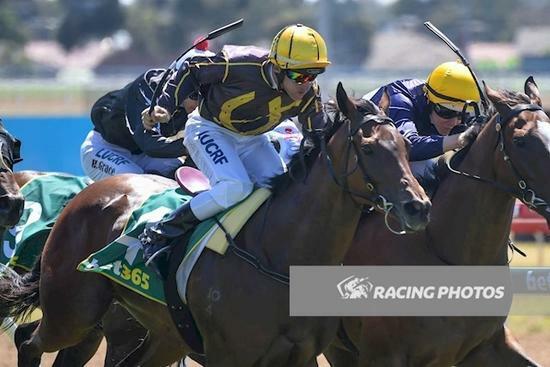 Empire Liberty managed to go back to back with a very determined win at Geelong over 1700m. Coming off his maiden win at Cranbourne on the wet track where he raced more forward to combat the rain affected track he enjoyed being back on top of the ground. In a fast run race where the leader went out as much as 10 lengths Empire Liberty had the odds on favourite on his inside all of the way with Dale Smith in the controlling position. The two of them set out after the tearaway leader and produced a ding dong struggle with the favourite bumping Empire Liberty several times in the straight but to Empire Liberty's credit he kept at it and got his nose down on the line. If he had gone under no doubt the result would have been reversed on protest. Great effort in the heat to come out and win again not easy to do off a maiden win. Great to see so many owners come down for the early start to cheer him on they certainly made their presence felt.